OptinMonster makes it easy to create an Inline campaign. Place this campaign below blog posts or within content sections. With OptinMonster, you can create an Inline campaign in just a few easy steps following this guide. What has changed with the release of OptinMonster 5.0? Also, if you haven’t reviewed the general process for creating a campaign, we encourage you to check out our Creating Your First Campaign documentation. The first step is create a new campaign. 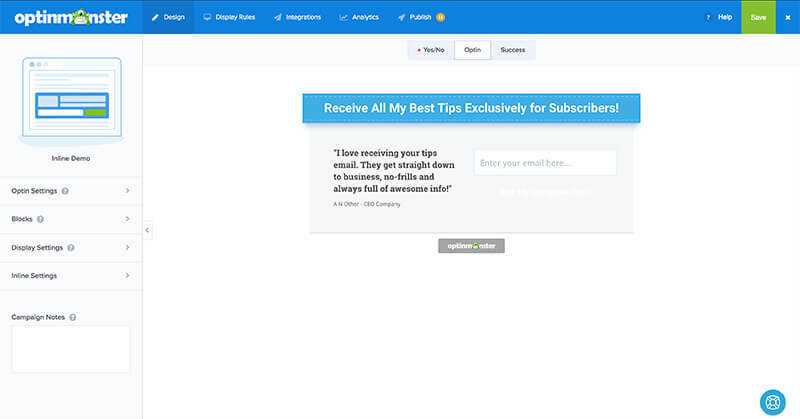 You should select the Inline Campaign Type and any theme. NOTE: You can customize the design with the drag and drop Builder if you want. The next step is to design your campaign according to the steps in Creating Your First Campaign. NOTE: See our Builder Overview for more information about how to use OptinMonster’s new drag and drop Builder. When you are finished, be sure to save your campaign and congratulations, you’re all done building your campaign! Click the Publish button at the top to get the embed code. For more information, see our guide on how to embed your campaigns. For more specific guidance on embedding your Inline campaign, please read our guide on how to manually add an Inline Campaign. Want to create gated content? See how to use OptinMonster’s content blocking feature! Q: What has changed with the release of OptinMonster 5.0? 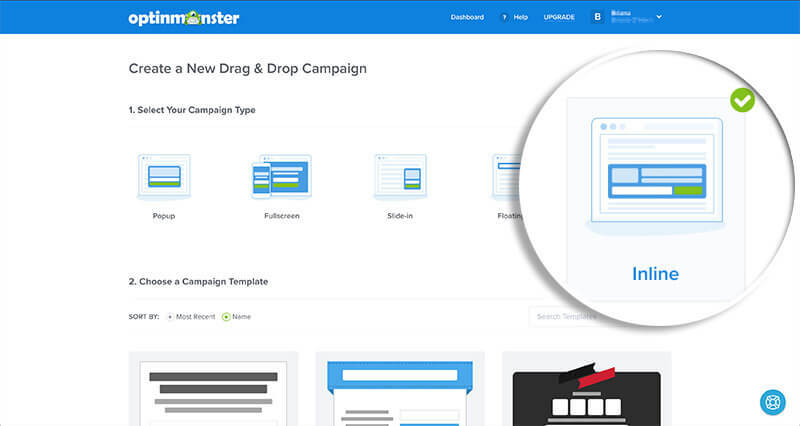 A: With the release of OptinMonster 5.0 and the new drag and drop Builder, the legacy “After Post/Inline” and “Sidebar” campaign types have been combined into the new Inline campaign type. The new Inline campaign type can be added to your via embed code, WordPress shortcode, and WordPress widget as shown in our guide our guide on how to manually add an Inline Campaign.